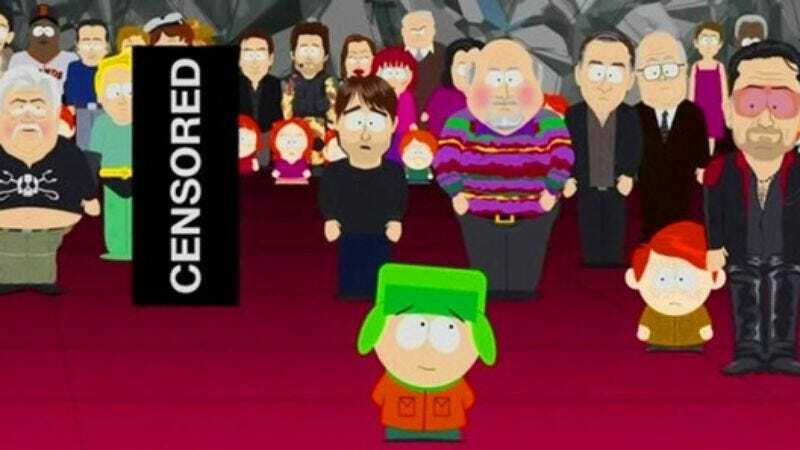 Remember back in 2010, when a radical Muslim group issued a totally rad death threat toward the creators of South Park, hoping to “raise awareness” of the fact that Trey Parker and Matt Stone might be murdered over depicting a cartoon Muhammad in a bear suit? And then a panicked Comedy Central not only blacked out all appearances of the prophet in the following episode, it also bleeped out every utterance of his name and the whole of Kyle’s usual, “I learned something today…” speech? Indeed, we all had a good chuckle about the ironic censorship of an episode mocking censorship, then returned to our lives as Triscuit-eating filth awaiting damnation. But the death wish that is our curiosity about the inflammatory remarks of cartoons has persisted, owing to the fact that “201” has still never been heard in its uncensored version anywhere (not even on the DVD)… until now. At the time of the episode’s censoring, Parker and Stone confirmed Comedy Central’s statement that the bleeping was entirely the network’s decision, and that it was not some “meta-joke” about censorship on their part. But considering the network opted to censor a speech about the effectiveness of violence and intimidation, all because of violence and intimidation, it all ended up being a big, “meta-joke” anyway—the kind that we would like to make clear we’re certainly not laughing about, because we don’t want to be murdered, please.